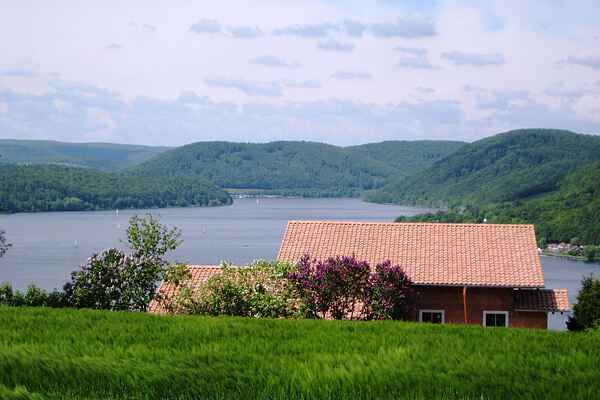 The Mediterranean-style house is situated above the lake like on a sunny observation deck, amidst an idyllic nature and adjacent to the Urwaldsteig, and it offers a fantastic view across the lake to Waldeck Castle and the mountain ranges of the Kellerwald-Edersee National Park. The large apartment consists of two separate living quarters with bright and tasteful furnishings. Due to the hillside location, both flats are on ground level. They can be reached via an external staircase. Each flat features a living/dining room, an open plan kitchen and a bathroom. You will have a total of three bedrooms at your disposal. Therefore it is ideal for spending your holiday as a family with private spaces for everyone. While staying here, the wonderful view you get to enjoy from each room in both flats gives you the feeling of being constantly connected to the lake, forest and surrounding mountains. You're welcome to use the sunbathing lawn located below the terrace. The ecological building materials and allergy-friendly furnishings emphasise thoughts of well-being. Upon request: If you book the apartment and need an extra bedroom, you can also rent the wooden summer house. This house has 2 full-size sleeping spaces. The panoramic position of the massive wooden house offers you the same view of the lake as the apartments. The distance between the flat and the terraced plateau with the wooden house in the garden is approx. 10 metres. The price for renting the summer house in addition to the flat is €25.00 per day (includes final cleaning). Only on request as well: A sauna with space for 4-5 people is available for a fee from 15/10 to 01/04.